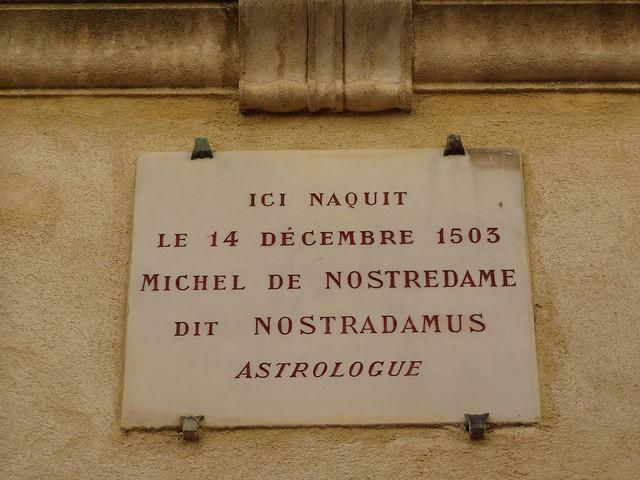 Michel de Nostradame or Nostredame known to us today as Nostradamus was born on the 14th of December 1503 in Saint-Rémy-de-Provence, Provence, France. Michel de Nostredame was one of nine children of Reynière (or Renée) de Saint-Rémy. The family had originally been Jewish, but Jaume’s father, Guy Gassonet, had was forced by the expulsion of Jews in Euorpean communities during the 14th and 15th Centuries to convert to Catholicism around 1455, taking the Christian name “Pierre” and the surname “Nostredame” (meaning Our Lady, the saint’s day on which his conversion is supposed to have taken place)1)True Prophecies of Nostradamus Adoni Publishing Dr. Sol Adoni. At the age of 15 Nostredame entered the University of Avignon to study for his baccalaureate. After little more than a year he was forced to leave Avignon when the university closed its doors in the face of an outbreak of the plague. After leaving Avignon, Nostredame claims he travelled the countryside for eight years from 1521 researching herbal remedies. In 1529 he entered the University of Montpellier to study for a doctorate in medicine. He was expelled shortly afterwards by the university’s procurator, Guillaume Rondelet, when it was discovered that he had been an apothecary, a “manual trade” expressly banned by the university statutes, and had been slandering doctors. The expulsion document (BIU Montpellier, Register S 2 folio 87) still exists in the faculty library. However, Nostradamus would still be known as a Doctor and that was how he was usually referred to in his times. After his expulsion, Nostredame became famous for creating a “rose pill” that supposedly protected against the plague2)True Prophecies of Nostradamus Adoni Publishing Dr. Sol Adoni. In 1531 Nostredame went to Agen. There he married a woman possibly Henriette d’Encausse, who bore him two children. In 1534 his wife and children died, presumably from the plague. After their deaths, he continued to travel, passing through France and Italy. On his return in 1545, he assisted the physician Louis Serre in his fight against a major plague outbreak in Marseille, and then tackled further outbreaks of disease on his own town of Salon-de-Provence and in the regional capital, Aix-en-Provence. Finally, in 1547, he settled in Salon-de-Provence in the house which exists today, where he married a wealthy widow named Anne Ponsarde, with whom he had six children—three daughters and three sons3)True Prophecies of Nostradamus Adoni Publishing Dr. Sol Adoni. 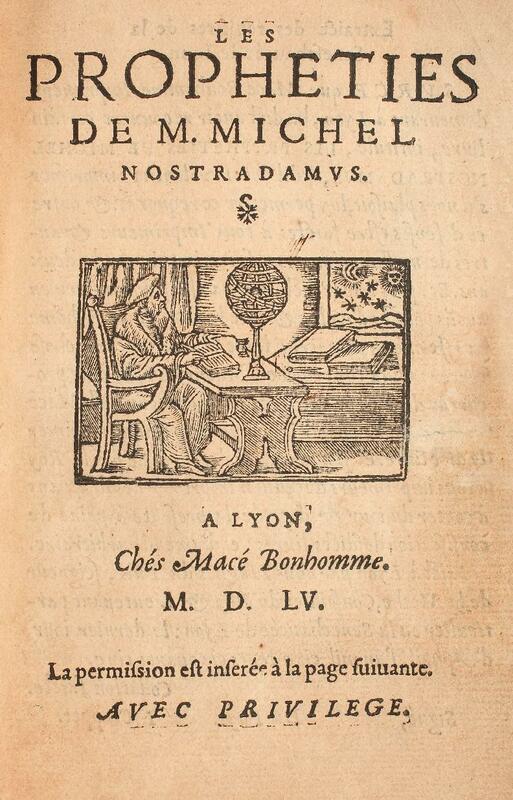 After another trip to Italy, Nostredame began to become known for his Almanchs. Following a popular trend, he wrote an almanac for 1550, for the first time and he began to Latinize his name from Nostredame to Nostradamus. He almanachs were a great success and he began to write one or more annually. They are said to contain at least 6,338 prophecies. Due to his fame as the author of his Almanchs the nobility and other wealthier persons of his times started asking for horoscopes and “psychic” advice from him. He then began writing a book of over 900 Poetic and Prophetic Quatrains called Les Propheties, which are The Prophecies for which he is most famous today. Some of the Quatrains were first published in a book titled Les Propheties (The Prophecies) in 1555 by Bonhomme and they were well received with many of the elite of France becoming enthralled with him. Catherine de Médicis, wife of King Henry II of France, was one of Nostradamus’ great admirers. Foreign figures that visted the Royal Court of Henry II commented in their jouranls had the Royal Court and the whole of France had been caught up in the wave of Nostradamus euphoria. 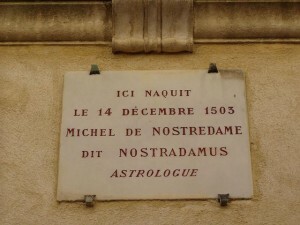 After reading his Almanachs for 1555, which hinted at unnamed threats to the royal family, Catherine summoned Nostradamus to Paris to explain them and to draw up horoscopes for her children. Queen Catherine then made him Counselor and Physician-in-Ordinary to her son, the young King Charles IX of France4)True Prophecies of Nostradamus Adoni Publishing Dr. Sol Adoni. Several accounts of Nostradamus’ life state that he was afraid of being persecuted for heresy by the Inquisition in his time so he had to cloak his prophecies in codes. He had a brief imprisonment at Marignane in late 1561. By 1566, Nostradamus’s gout turned into edema, or dropsy. In mid June he summoned his lawyer to draw up his Last Will and Testament bequeathing his property plus 3,444 crowns (3,444 approximate ounces of GOLD or 5 Million Dollars today) to his wife pending her remarriage, in trust for his sons pending their twenty-fifth birthdays and his daughters pending their marriages. This was followed by a codicil. On the evening of 1 July, he is alleged to have told his secretary Jean de Chevigny, “You will not find me alive at sunrise.” The next morning he was reportedly found dead, lying on the floor next to his bed. He was buried in the local Franciscan chapel in Salon but was re-interred during the French Revolution in the Collégiale Saint-Laurent, where his tomb remains to this day5)True Prophecies of Nostradamus Adoni Publishing Dr. Sol Adoni. After the death of Nostradamus complete editions of his Quatrains containing 942 Prophecies began to appear and there are many variations. For centuries famous Occult authors and Nostradamus commentators referred to the 1566 Pierre Rigaud edtion which became lost to history until recently when it was discovered in a private collection as well as the National Library of Bavaria. 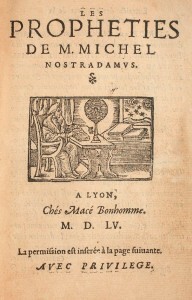 This edition is superior to the many other early editions of the Prophecies and it is starting to be once again accepted by scholars as the earliest authorized edition of the complete prophecies of Nostradamus due to the quality of the text and typesetting and spelling6)True Prophecies of Nostradamus Adoni Publishing Dr. Sol Adoni. 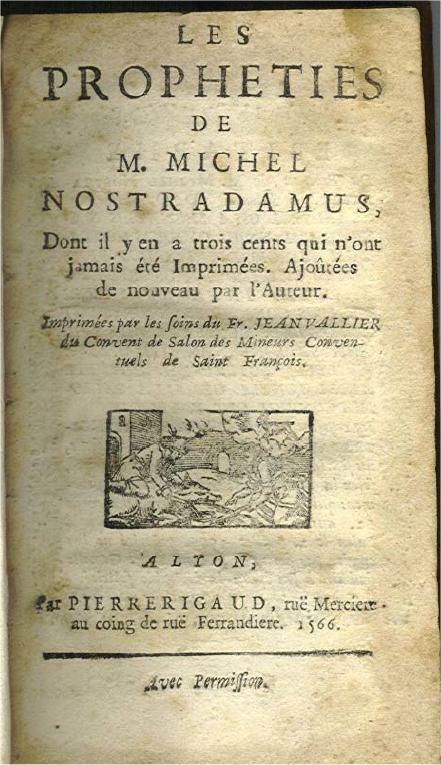 Due to there being so many variations of early Nostradamus Editions with at least 942 or even more quatrains in them, some scholars are reluctant to accept the fact that a relative of Benoist Rigaud named Pierre may have printed the actual first edition around 1566. Many just accept it being printed by the son of Benoist Rigaud who printed books in the later 16th Century into the early 17th Century. 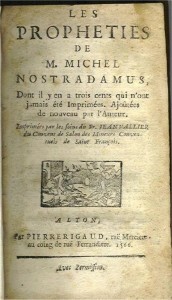 There are several known 1568 Benoist Rigaud editions and most likely due to the sloppy spelling are early pirate editions of either a 1568 Benoist Edition or the famous 1566 Edition Princeps which has been recently found and confirms that ancient authors were correct in saying this edition was the superior edition to all other early Nostradamus editions.